Mon Power, a subsidiary of FirstEnergy Corp., is upgrading a transmission substation near Thomas, West Virginia., to help connect a new wind farm to the regional electric grid. The work also is expected to enhance electric service to Mon Power customers in the area. The operator of the new wind farm in northwestern Grant County will build a new 11-mile long, 138 kV transmission line that will connect to the substation. Slated for completion in late November, the upgrade included a new circuit breaker and relay devices, which automatically interrupt the flow of electricity to protect equipment from events such as tree-related outages or lightning strikes. 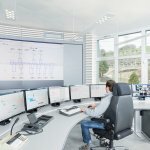 Transmission dispatchers can remotely monitor conditions at the substation, and if needed, reset the devices automatically to help reduce the duration and number of customers affected if an outage occurs. Mon Power substation construction crews have completed all foundation work and used a heavy-duty crane to position the new transformer into place on its cement pad. The new transformer measures about 14 feet long by 8ft. wide by 8 ft. tall and weighs about 112,000 pounds.